We are widely acclaimed for offering a durable range of Variable AC Transformer, commonly known as Variacs. Our Variable AC Transformer is used to provide a voltage-adjustable source of AC electricity. The core of the Variable AC Transformer is made of high grade, non aging continuous CRGO strip and carefully annealed that results in low magnetizing current and core losses. The output is linear and Variable AC Transformer does not produce any distortion in the wave form. We have designed Variable AC Transformer to withstand heavy overloads of short durations such as starting currents of motors. 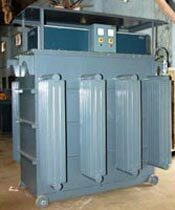 We are proficient in offering Variable AC Transformer as per the details given by the clients. 28 Amps to 600 Amps in Single and 28 Amps to 1000 Amps in Three . Phase: Single and Three Toroidal Coils with CRGO Steel sheet Core. Voltage Variation capability: 0 - 270 V A.C in Single and 0 -470 in Three *. Motor Operated with Step - Syn Motor. Remote Motor Operated with Step - Syn Motor. IS 5142. Oil Conforming to IS 335. Copper Conductor compliant to IS 13730 - 34. Open Type for Panel Mounting. Portable Type for Table Mounting. M.S Tank with Oil Immersed and Pressed steel radiators. Connector plate or Bus bars in cable box. Push buttons for motor operated dimmer-Other specific customer requirement.